Most varicose veins appear on the legs. When investigating the cause of varicose veins, most people can understand why we examine the legs with duplex ultrasound. Other research performed at The Whiteley Clinic has found that failure to identify and treat the pelvic veins that are causing leg varicose veins appears to be a major cause of why women get the veins back after receiving normal treatments elsewhere (see: http://www.jvsvenous.org/article/S2213-333X(12)00035-2/abstract). When women come to The Whiteley Clinic with varicose veins or recurrent varicose veins, and the duplex ultrasound scan of the leg varicose veins shows that they are coming from the pelvis, we need to see which of the veins in the pelvis is causing the problem. 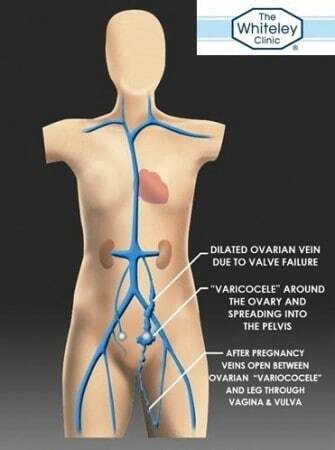 In the female, there are two ovarian veins and two internal iliac veins which can cause pelvic varicose veins. Any of these veins can be the underlying cause of the problem. The veins in the pelvis are more difficult to see than the veins in the legs as they are deep inside the body. As such, we cannot use the same duplex ultrasound technique as we can for the veins in the thigh or calf. Many doctors are nervous about these veins and just ignore them. However, if these veins are ignored, they are not treated and not surprisingly this is a common cause of recurrent varicose veins. Research from The Whiteley Clinic has shown that the best way to look for pelvic varicose veins is a technique called transvaginal duplex ultrasound (TVS) (see: http://www.ncbi.nlm.nih.gov/pubmed/25324278). This technique was developed by Judy Holdstock, chief vascular technologist at The Whiteley Clinic. Judy and her colleague, Charmaine Harrison, developed the Holdstock-Harrison technique to diagnose pelvic vein reflux and this forms part of the Whiteley Protocol. 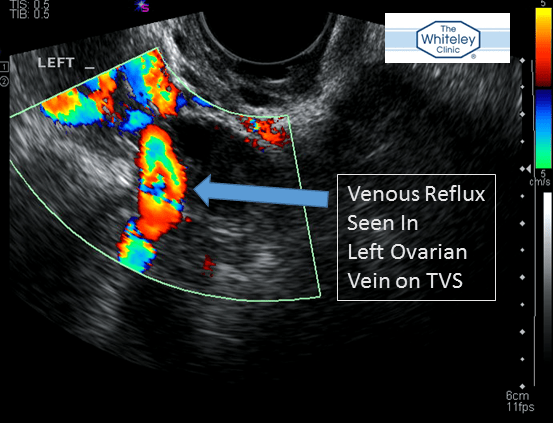 Transvaginal duplex ultrasonography (TVS) as performed at The Whiteley Clinic is not widely available anywhere else in the world as it is a very new technique developed at The Whiteley Clinic. It does mean that a large number of women with pelvic varicose veins which are causing their leg varicose veins are unlikely to get a full diagnosis and successful treatment elsewhere. As with any new technique, there are some drawbacks. If a female patient does not consent to a transvaginal scan, then we are unable to use this technique and have to use an inferior technique such as CT scanning or MRI (MRV). The second main drawback is with men who have pelvic varicose veins. At the present time we have not developed the technique sufficiently to diagnose pelvic vein reflux (or pelvic varicose veins) with duplex in males and so have to rely on CT scanning or MRI (MRV). Pelvic vein reflux in female patients with varicose veins: comparison of incidence between a specialist private vein clinic and the vascular department of a National Health Service District General Hospital. Marsh P, Holdstock J, Harrison C, Smith C, Price BA, Whiteley MS. Phlebology. 2009 Jun;24(3):108-13. doi: 10.1258/phleb.2008.008041.